Hollybeary Creations : Wanna grab lunch? Happy Tuesday everyone... 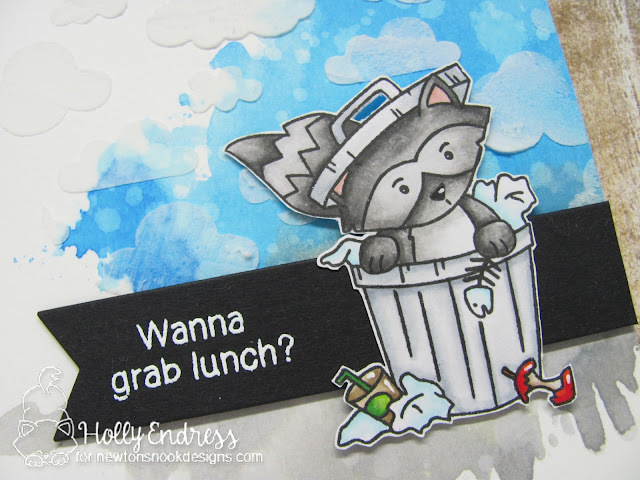 I'm over on the Newton's Nook Designs blog today with a cute card featuring the adorable Raccoons from the Raccoon Rascals stamp set. I started with a piece of Distress watercolor paper 4 x 51/2" and then I added some Salty Ocean & Hickory Smoke Distress Oxide inks. Once the Distress ink was dry I added some clouds to the background with the Cloudy Sky stencil and White embossing paste. 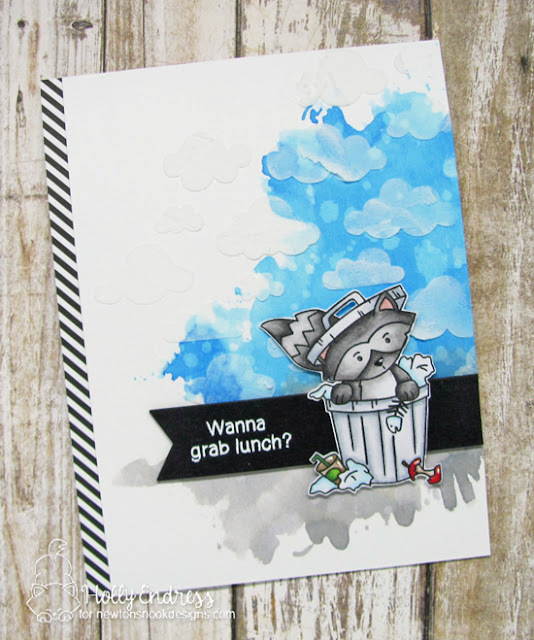 While the background was drying I stamped the image onto some X-Press It blending cardstock and colored it in with Copic Markers. I trimmed the image out with my scissors and then added some highlights with a White Gel pen. I die cut a Black banner from the Frames and Flag die set and heat embossed the sentiment in White. I created a top folding White A2 size card base and added a strip of Black & White paper along the edge. Then I adhered the background panel flushed along the right side. I adhered the banner and image with some foam adhesive. Head over to the Newton's Nook blog for more great inspiration from the Design Team!